OK, now that I gave you all that information, please don't judge me. This is like an episode of the show hoarders and messy ones at that. This, my friends, is my laundry room. It is a catch all for everything, it holds our washer, dryer, cleaning supplies, linens, air drying clothes, clothes to iron, extra folding chairs, extra stools, luggage, poker table (never used), folding tables, vacuums, crafts, wrapping supplies, purses, (yes, you read that right), you name it, it's in there. I tend to keep my house on the neat side, no clutter, simple decor, so everything that has no where to go, gets dumped in here. It is the most embarrassing room in our house. I never thought I would have one of those pretty laundry rooms. I actually laugh when I see them. 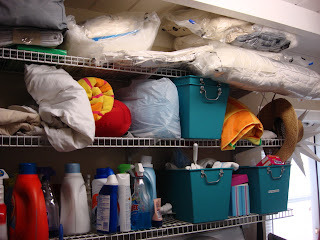 Considering that I no longer had access to the closet inside my laundry room, I decided to just organize a bit. 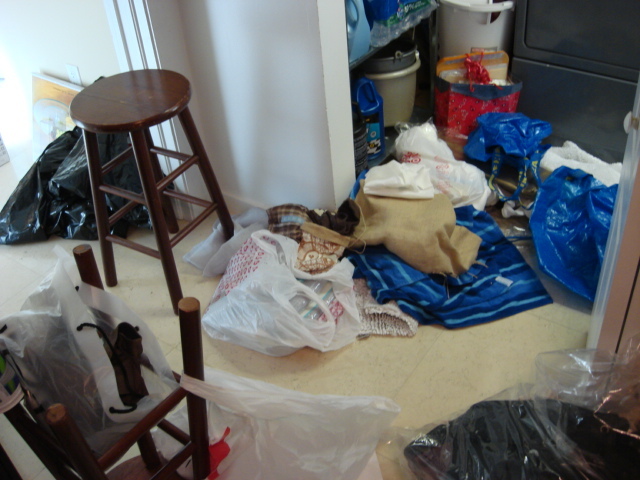 I took all the stuff that was blocking the passage to the closet out of there. I semi organized the closet and somehow found inspiration. I have decided to make myself a pretty laundry room. It will never be like the ones you see out there in blog land (maybe I will search for some and post them, so you can laugh at mine), but at least one that is not a disgusting, hoarding pig sty. I found some boxes at Target in black and white. My laundry room is off of my black and white office, I figured I would keep the trend. It's a project in the works. It will take some time. Really, it's not going to be a major transformation, I am way to lazy to paint the room and that itself is a mistake...but oh well. Stay tuned. My laundry room is right of of my kitchen and houses craft supplies, cleaning supplies, cat box (EEWWWW) and everything else that my pantry floor doesn't. 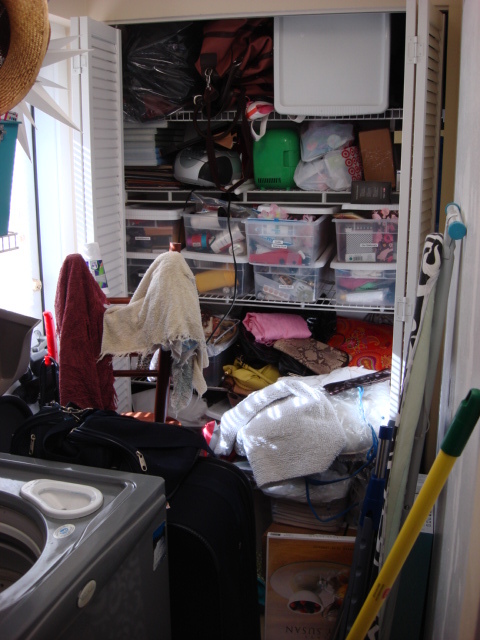 It is not fun during laundry days when everything is piled up outside the room and you are trying to get to the pantry. I don't think your laundry room is so bad. I too would love to have a pretty laundry room but I dont see that happening anytime soon. Wow, it looks fabulous! 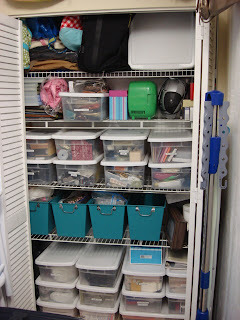 So organized and just overall awesome! Our laundry room is in the large storage room in the carport. I dream of the day we have an actual laundry room [sectioned off from the rest of the storage room]. This makes me laugh because mine looked worse than that and I just cleaned it out yesterday. :) It looks so much better and so does yours. Good work! Great job!!! 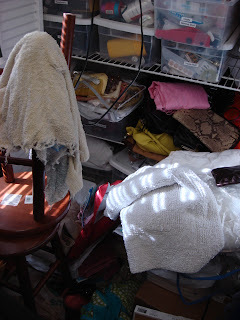 I too have a messy garage/laundry room. Yours looks great now! Do you watch FRIENDS?? There's that episode where Monica has a secret locked closet that nobody has even seen the inside of. Turns out she's a closet slob (but is super ocd clean otherwise). It's a classic! 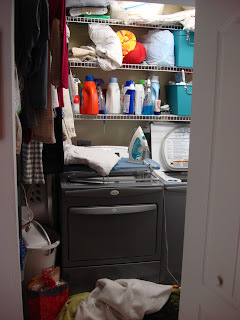 Great post....I am convinced laundry rooms are meant to be cluttered....I don't think you can avoid it. It looks great! Our laundry is also a disaster, I always see it as a dumping ground :). I am pretty much a neat freak in the other rooms of the house, but it is so easy to let that one go. It will probably be one of the last rooms I design. I am on my second round of decorating the rest of the house, so it will probably never get touched :). Good luck organizing. Up until four days ago, we had the very same washer & dryer as you!! I've never met anyone else with the gray Calypso machines! Sadly, ours just bit the dust. Love the black & white boxes. Can't wait to see where your room takes you! My laundry room is a bit crazy right now, too....I could use some inspiration!! Nice Job! What a great transformation! 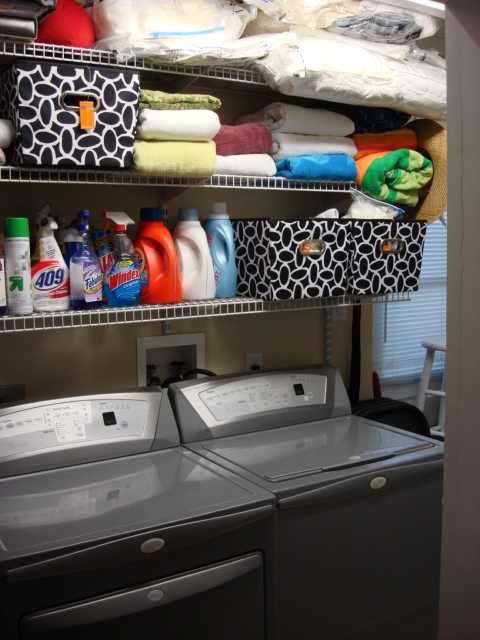 I want a 'pretty' laundry room too. I don't have nearly as much stuff as you do in mine, but I don't really have any type of shelving or anything either. I might need to start with that.